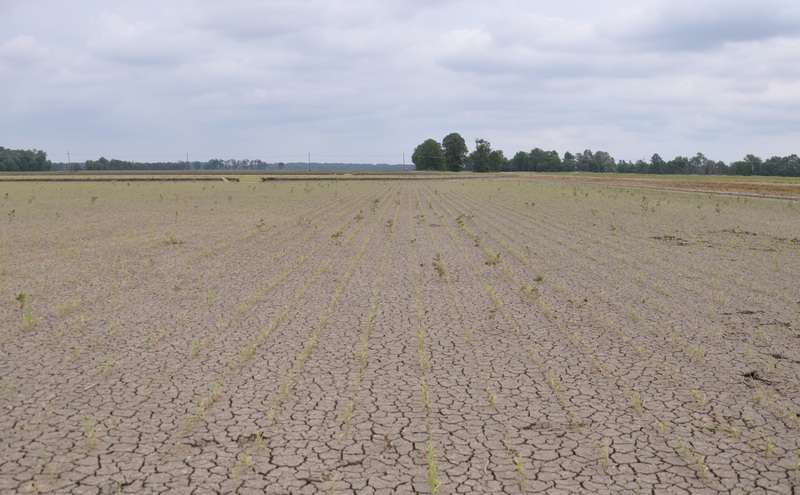 On Friday, Nick and I made the trek to West Carroll Parish in north Louisiana to scout a rice field that Richard Costello had called me about on Thursday. The field was initially thought to be suffering from herbicide drift injury. LSU AgCenter County Agent Myrl Sistrunk had called Weed Scientist Bill Williams out to investigate. Upon a detailed inspection they found a damaging infestation of thrips. The thrips could easily be found on virtually every plant we inspected. The best scouting method for thrips is to visually inspect plants. 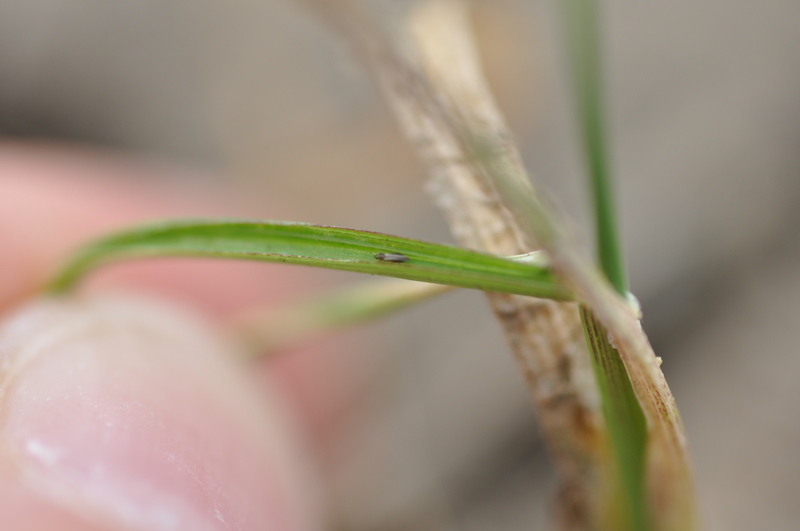 The thrips were often found on the leaf sheath near the collar or inside the leaf sheath. Thrip on leaf blade near collar - this is a typical location to find them on the plant. They will quickly run/hop when disturbed. You can also tap plants onto a white sheet of paper and look for the thrips on the paper. Thrip on rice leaf blade. I learned first-hand that they will in fact “bite” you with their rasping mouthparts. They annoyed us for most of the ride home. 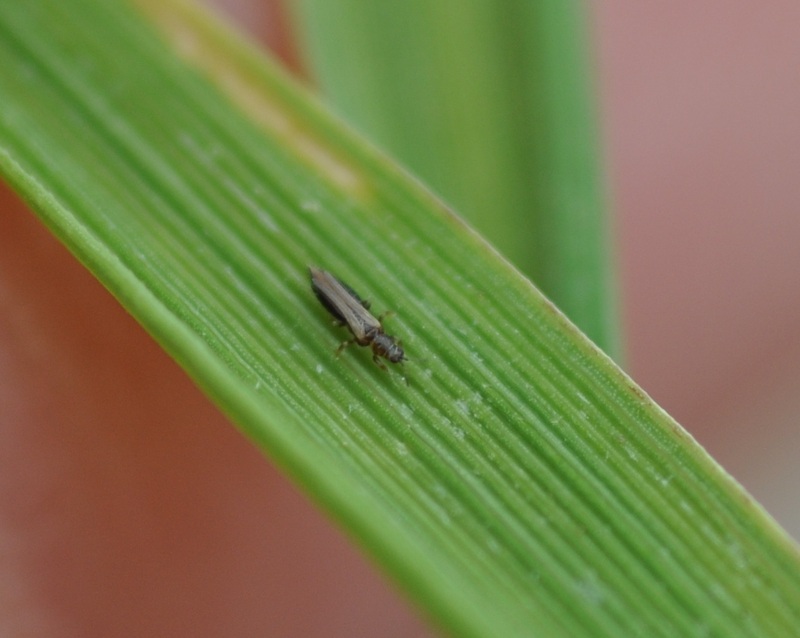 Thrips injure plants by using a scraping mouthpart to macerate (tear) the leaf tissue. They then extract the plant liquids. 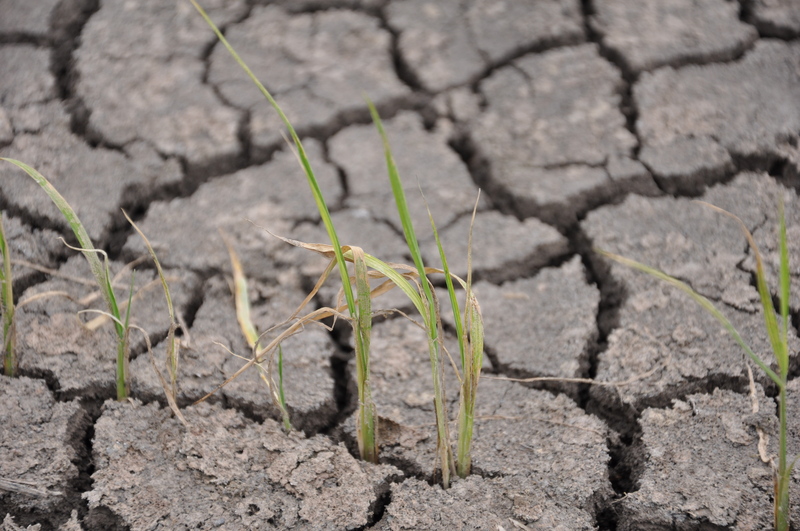 This causes desiccation and would typically not be a problem, except for the dry, windy conditions we are experiencing this season. 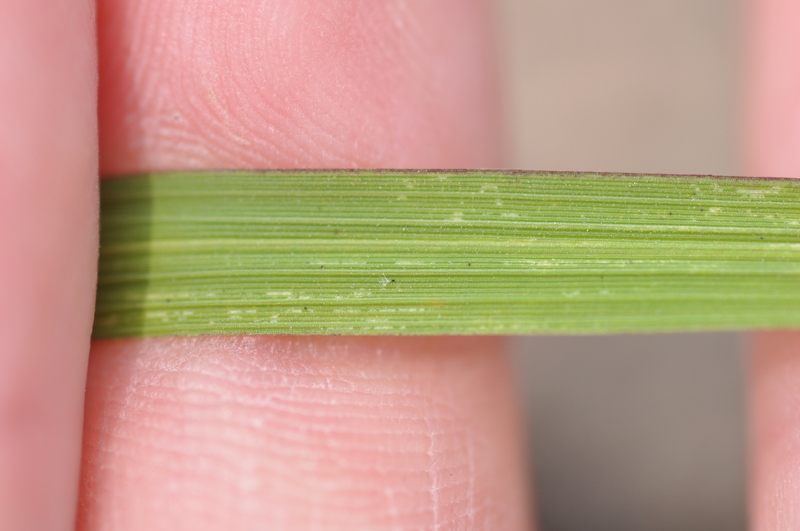 Thrip feeding injury on a rice leaf. In many cases there were streaks of white near the leaf tip. I have not had the chance to confirm the species yet, but it looks like they may be tobacco thrips. 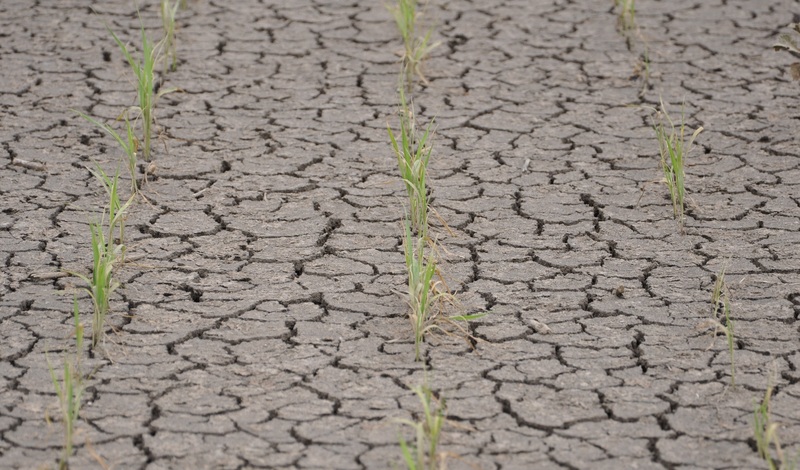 The infestation and plant damage in this particular field is disconcerting because the field is CruiserMaxx treated hybrid planted at a 25 pound seeding rate. The situation is complicated by the fact that the field has received about 10 inches of rain since planting. This was received in five separate rain events. The field started to head south after a flush was applied about a week ago. At this point the field is very dry and plants appear to be desiccating and stressed from the thrips feeding on the leaves. The field isn’t ready to hold a flood yet. We could not find any natural enemies in the field, and due to the ongoing injury caused by the thrips feeding I recommended a pyrethroid application to knock back the thrips population and buy some time before flood. Also, the lack of apparent activity against the thrips caused some concern about the ability of the CruiserMaxx to provide effective control of rice water weevil larvae after application of permanent flood. They may consider a second application of pyrethroid at permanent flood if weevil adults are present in the field. Overall the field still has a good stand of rice, which appears to be thicker than many hybrid rice fields I have scouted this season. 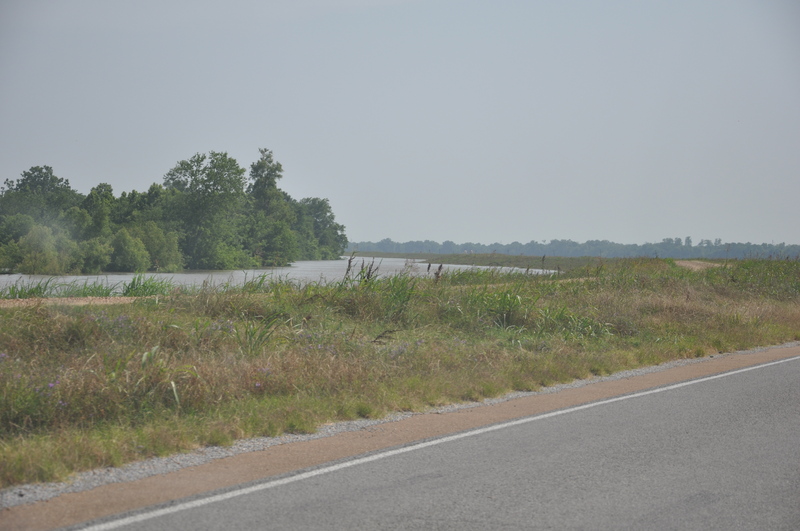 On our way back to Baton Rouge we took the levee road and witnessed the Morganza Spillway flooded with water. 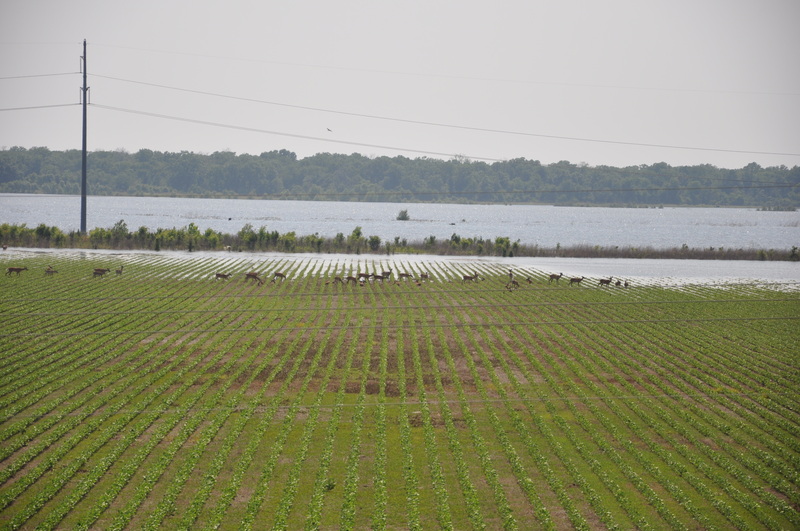 You can see in this picture how close the water came to the top of the levee - just south of Vidalia, north of Blackhawk Farm. 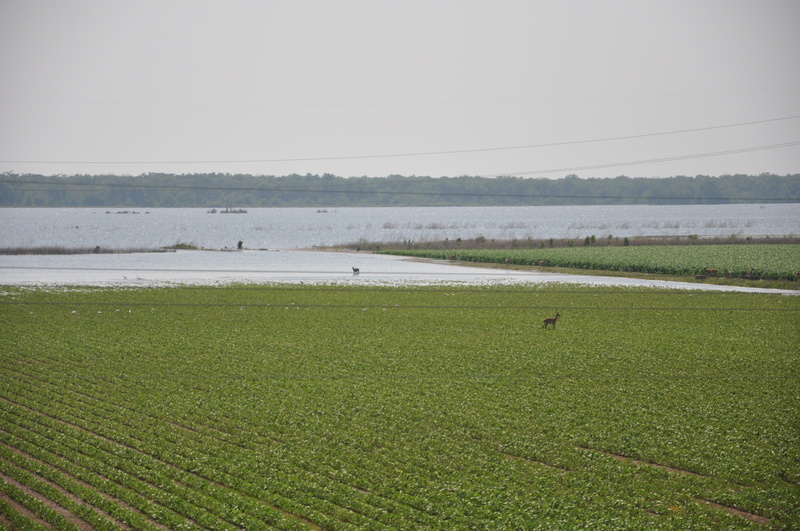 We also saw some deer grazing in a soybean field that was mostly flooded. 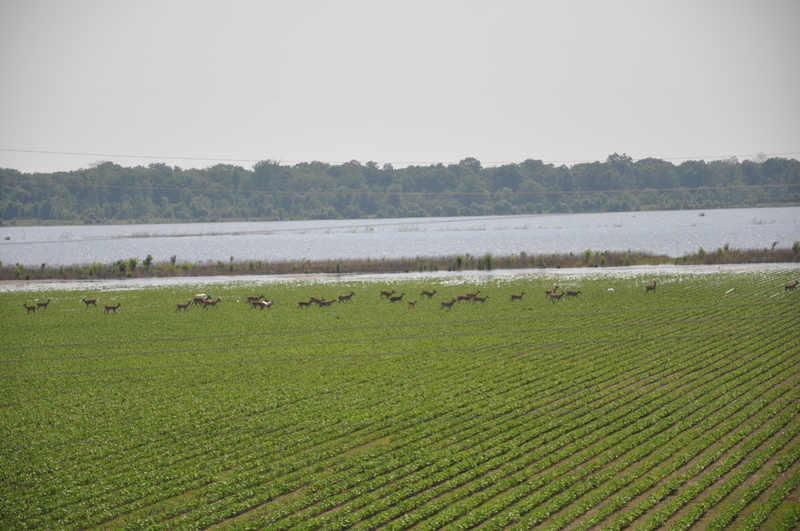 If you’ve read Johnny Saichuk’s field note for this week you’ll notice that we observed the same herd of deer. Apparently they are well-settled in this field. 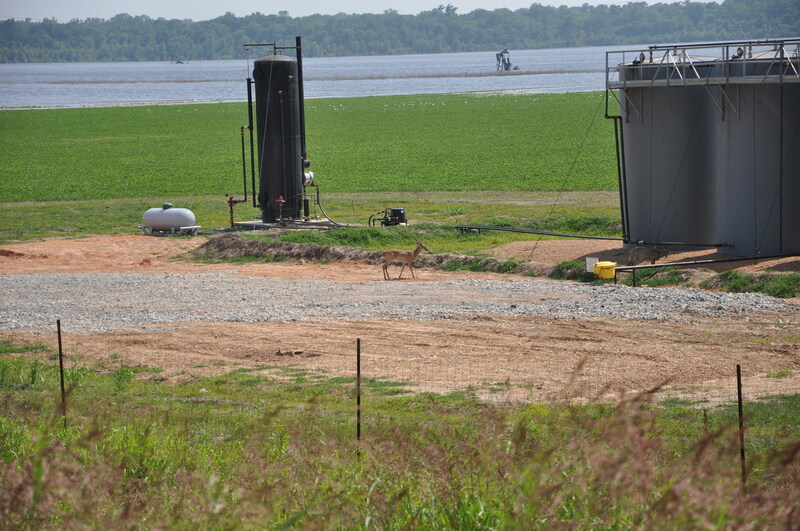 It looks like whatever the water doesn’t take, the deer will finish off. I have more pictures to share, but I don’t have the files with me at the moment. Also, this week I had reports of sugarcane beetles, armyworms, chinch bugs, and colaspis in Louisiana rice. Many of these early-season insect pests should go away as we approach permanent flood. Then we’ll need to make sure good plans are in place for rice water weevil management.